A highly intelligent breed desperate for a job to do is the best way to describe the Icelandic Sheepdog. A softy on the inside, this breed is almost desperate to please and will not respond will to harsh treatment, easily becoming depressed and anxious. They are easy to train and love to be around their families. This is a breed that is very prone to separation anxiety and if it will be left alone for long periods must have a companion to keep it company. Ideal for homes with small children, this breed is soft and gentle. If things get too rough, this is a dog that will remove itself from the room rather than display any aggression. Barking is in this breeds' blood, so they may not be ideal for homes with neighbors that dislike noise or small apartments. If there was a negative about owning an Icelandic Sheepdog, it would be how difficult the breed is to contain. This is a dog that likes to dig, jump and climb; they can get into anything. Owners would be wise to create a special "digging area" in their yard where the Icelandic Sheepdog can dig to its hearts content without incurring punishment. When training the Icelandic Sheepdog it is important to remember that the breed is easily broken, so training must be gentle but firm; a harsh word can devastate this breed. Otherwise this is an excellent dog that even loves to travel. Some mild grooming may be necessary. 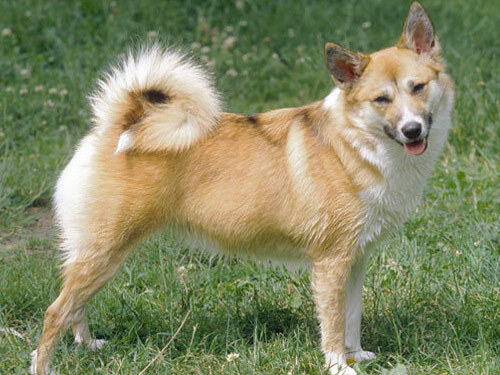 The most common health concern with the Icelandic Sheepdog is his dysplasia. This is caused by incorrect formation in the hip joint and is often diagnosed by 18 months. It is recommended that jogging and other running activities be limited before 18 months to avoid potential damage to the joint. Possibly one of the oldest breeds in the world and maybe even brought to Iceland by the Vikings in 870. In the 1600's these dogs were exported to Great Britain. The population of the breed has risen and fallen throughout the centuries. The have been prized for their herding ability especially on farms, many of which had 2-5 or more dogs in the 1880's. By the 1960's, however, these dogs were close to extinction due to a combination of government policies and deadly diseases. Thankfully, English lord Mark Watson noticed the decline of the breed, and taking a strong interest, began a breeding program in the state of California.